With a great selection of public parks, beautiful beaches and a wide array of fun activities to do indoors, Santa Cruz is one of the best places in California for great toddler entertainment. No matter what your young child likes to do for fun, you can find the perfect way to keep them busy and entertained all day long. Best of all, all of the great things that toddlers enjoy in Santa Cruz all just happen to be perfect things for the whole family to enjoy as well. The beach is always fun for all ages and toddlers enjoy spending time on the soft sandy beaches of Santa Cruz. 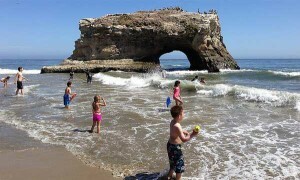 One of the more popular beaches is Natural Bridges State Beach and this beach has plenty to offer year-round. During the spring and summer, you can take your toddlers to see seals, whales and other sea life splashing around just a little way out from the shoreline. During the fall, it’s always fun for the kids to take a trip to see the beautiful monarch butterflies as they flutter around eucalyptus trees. Along the shoreline kids always like to see if they can find seashells, sea anemones and other ocean life that may wash up onto the shore. There is a great picnic area at Natural Bridges and a visitor center where you can learn a little about the local history. Be sure to take your wallet because the kids usually like to grab a little trinket in the small gift shop in the center. There are plenty of nature trails surrounding the beach where you can take off on your own, or enjoy a guided tour where you can hear all about the local wildlife and get a glimpse into the history of the area. What better way to entertain a toddler than letting them see, and touch, a shark! At Seymour Marine Discovery Center, the young and the young at heart can enjoy learning about sea life in a fun way where being hands on is the best way to learn. The center features a large aquarium where children and adults will have the opportunity to touch a live shark and see many other sea animals. Outside, there are large skeletal sculptures of elephant seals, gray whales and blue whales and families can enjoy hiking on more than 45 acres of beautiful coastal land where you can see luscious prairie land, wetlands and scrubland. Many animals live in the area and young children always like to see brush rabbits, bobcats and other animals while enjoying the beautiful area surrounding the center. For directions and admission information, please contact Seymour Marine Discovery Center by calling: 831-459-3800. From small workshops to crafts and demonstrations, Santa Cruz Museum of Art and History is one of the best places to spend the day with your child in Santa Cruz. The first Friday of every month the museum offers free admission to everyone and every third Friday, it is Kid Happy Hour from 4-5 pm where there is always plenty of play time and fun activities for kids of all ages. Santa Cruz Museum of Art and History can be contacted by calling 831-429-1964. 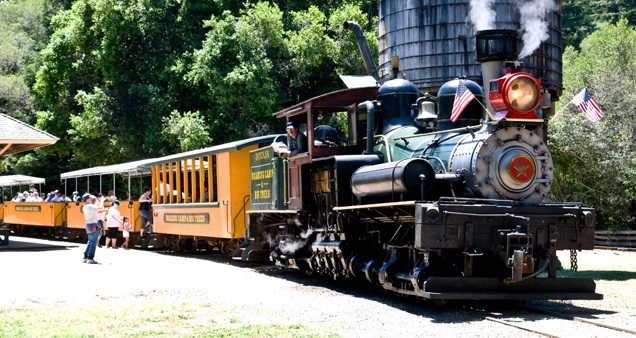 No matter what time of the year it is, Roaring Camp Railroads is always a popular attraction for families and children of all ages from toddler to teen and even older. Once you are all aboard the train, you can choose from taking a round-trip ride to scenic Bear Mountain and back or a longer ride all the way to the Santa Cruz Beach Boardwalk. During the holidays, families enjoy taking a ride on the train when it’s all lit up with Christmas lights and children get to have a little visit with Santa Claus himself! The special rides begin at the boardwalk and the children will be able to ride the rides, play the games and enjoy great holiday snacks and other foods during their time on the ride and while visiting the boardwalk. This is an attraction that is fun every day of the year and people of all ages enjoy riding the train. To reserve a spot on the train or for further information on times, special events and other information, you can contact Roaring Camp Railroads by calling 831-335-4484. There are also several local movie theatres, public parks and of course, plenty of shoreline to take the kids to have fun at the beach while in Santa Cruz. No matter what your child enjoys, you can find plenty to do with them in beautiful Santa Cruz, California.